Volume 39, Number 4 of the Cougar Chronicle. 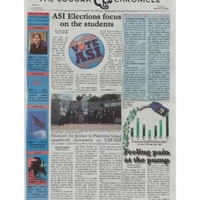 The issue includes stories on Associated Student Inc. elections and campus sports. ,” University Archives at the CSUSM Library, accessed April 20, 2019, https://archives.csusm.edu/student-newspapers/record/68.